After defeating the Irish team in the first T20I, Afghanistan is set to host Ireland in the second T20I at Rajiv Gandhi International Cricket Stadium, Dehradun. The Asian team would be hoping to seal the three-match T20I series heading into the second match. As for the visitors, they need to bounce back in style if they want to stay alive in the series. The stage is set for another intriguing contest between two dark horses in the cricketing world. Ireland and Afghanistan are on the Indian tour for 3 T20Is, and 5 ODIs. Having won the toss, Ireland elected to bat first in the opening T20I. They posted a below-par score of 132 runs in their quota of 20 overs. Paul Stirling looked in good nick for his 23 runs before getting out to Mohammad Nabi. The Irish batting lineup started to collapse when they found themselves reeling at 65-6. However, Stuart Poynter and George Dockrell steadied the ship to post 132 runs on the board. Irish bowlers tried their best to bring their team into the contest but lost the match in the final over by five wickets. The Afghans were the clear favourites going into the opening match of the series. That proved out to be the case when they held their nerves till the very last over to emerge victorious in the first T20I. Afghanistan had stumbled in the initial stages of their innings while chasing a small total and found themselves lurching at 50-5 after just seven overs. 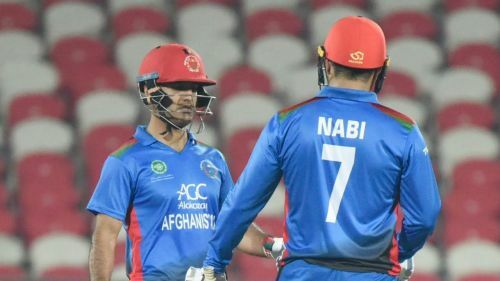 At this juncture, Mohammad Nabi and Najibullah Zadran stitched a match-winning partnership to bail their side out of trouble. The duo added 86 runs to take Afghanistan over the line in the opening T20I. After the win in the first T20I, Afghanistan has extended their winning streak as they haven’t lost any match against the Irish side since 2013. The Afghans would be eyeing to emerge victorious in the upcoming match to clinch the T20I series. The visitors need to bolster their batting lineup against the spin trio of Afghanistan. James Shannon, who has scored a T20 fifty against India, can be included in the lineup. Afghanistan is likely to go with the same winning combination.